What Do You Think About the Grammy Nominations for 2013? 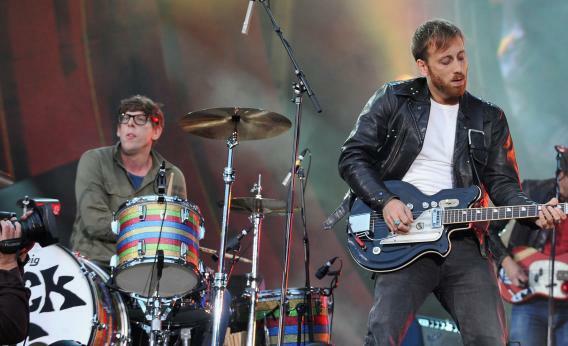 Patrick Carney and Dan Auerbach of the Black Keys perform onstage at the Global Citizen Festival tn Central Park to end extreme poverty in September 2012. Can they win a Grammy or two for El Camino? The 2013 field of Grammy nominees is surprisingly strong. And unlike last year, where it was a foregone conclusion that Adele would sweep every category in which she was nominated, this year there is a lot more parity. There are quite a few categories where anyone can win. Here are some of the categories I am most excited about. 2012 was a year of solid singles, so naturally, this is a competitive category. Taylor Swift continues to churn out a solid album every two years. While her latest album, Red, did not meet the cutoff for this year’s Grammys, the lead single “We Are Never Ever Getting Back Together,” earned a nomination. Gotye went from a guy who previously charted only in Australia and Belgium to a worldwide phenomenon thanks to his breakout hit “Somebody That I Used To Know.” The Black Keys won three Grammy’s at the 2011 awards, so they are definitely Grammy favorites. Tough to pick a winner with such stiff competition. I think it’s Gotye’s award to win, but Swift and Fun will be close contenders as well. They earned six Grammy nominations for 2013 Grammy Awards in November. With so much momentum, I really think this is their year to win Album of the Year. But that’s not taking anything away from the other nominees. Channel Orange is among my favorite R&B albums to come out in the last 10 years. Jack White—whether performing in the White Stripes, in his side projects The Raconteurs and Dead Weather, or as a solo artis—continues to be push the envelope in modern rock. Two of the most inescapable songs of the year in “Call Me Maybe” and “We Are Young” earned deserved nominations. Miguel, along with Frank Ocean and the Weeknd, has really helped restore my faith in R&B music. I was very excited to see “Adorn” get nominated here, though I doubt he will win. Despite having a great body of work, Kelly Clarkson is sadly overlooked by Grammy voters, so I have a feeling she won’t win here. As much as I like all of these tracks, my personal favorite in this category is Ed Sheeran. Because Song of the Year is an award for the songwriter rather than the performer, this weighty, yet pleasant song about drug addiction and homelessness stands above the rest. Great category! A rising country star in Hunter Hayes, a soulful roots rock outfit in Alabama Shakes, a great folk-rock band in The Lumineers, the biggest indie pop band of the year in Fun., and R&B’s biggest alternative star, Frank Ocean. Best New Artist is a very tricky category when there isn’t a clear-cut favorite. Fun is the most popular band on here, but if popularity counted, Justin Bieber and the Jonas Brothers would have won this award in the past. My personal favorite is Frank Ocean, and I’m also picking him as a dark horse to win this category. My favorite album here is Ceremonials, and it’s not even close. Florence and the Machine are making music that sounds like nothing else out there with their soulful blend of baroque pop. Overexposed was just an okay album. The Truth About Love is a good album, but Pink doesn’t have a good track record at the Grammy’s. Of her three previous wins, two of them came on collaborations. Of Fun.’s six nominations, I think this is their award to win. They are easily the biggest stars in this category. This is definitely my favorite category. I saw Steve Aoki at Nocturnal Wonderland earlier this year. I’m a longtime fan of the Chemical Brothers, who I have also seen in concert. I’ve seen Kaskade spin at the Marquee in Las Vegas twice in the last year. And of course, Deadmau5 and Skrillex are megastars. My favorite album here is Fire & Ice. It’s basically a dual album. The first 10 tracks are the Fire side, all songs made for the dance floor. The next ten tracks are the Ice side, downtempo remixes of the first ten tracks. It’s like a party and an afterparty in one package. On a side note, I strongly feel that Flo Rida’s Wild Ones should have been nominated here. Yes, he’s a rapper, but he makes dance music. Wild Ones is a dance album. “Whistle” and the title track are dance songs. Three tracks are remixes of dance songs. “Good Feeling” is a remix of Aviici’s “Levels;” “I Cry” is a remix of Bingo Players’ “Cry;” and “In My Mind (Part 2)” is a remix of Ivan Gough and Feenixpawl’s “In My Mind.” This should be in the dance category in place of Chemical Brothers’ Don’t Think, which is a live set of old songs. Should be between The Black Keys and Jack White. Coldplay is in a unique position since the lead single, “Paradise,” was nominated for a Grammy last year. I fear that may lead voters to feel their album is old news. Springsteen stands a chance of winning a song award for his single “We Take Care of Our Own,” but I don’t see his album winning here. Muse won Best Rock Album two years ago for The Resistance, and The 2nd Law is steadily gaining momentum, so they are sleeper contenders here. This a very exciting category, comprised of the difficult to categorize artists and albums. The Idler Wheel was Fiona Apple’s return after seven years away. Bad as Me is Tom Waits’ return after a seven-year absence. Gotye is the biggest star of the moment in this category. M83’s album Hurry Up, We’re Dreaming is one of my favorites in 2012. And then there’s Bjork, one of the most innovative artists in the world over the last 20 years, who somehow has never won a Grammy. I hope Bjork can finally get a Grammy, but I suspect this one will go to Gotye. I really dislike the separation of the R&B categories. I’m tired of seeing “traditional” R&B being separated from the so-called “urban contemporary.” It makes no sense in general, and this year it really makes no sense. Miguel, Frank Ocean, and Robert Glasper Experience put out exceptional albums. Tamia, Tyrese, and Chris Brown put out weak albums. Meanwhile Elle Varner’s Perfectly Imperfect wasn’t even nominated. This should be one category with Miguel, Frank Ocean, Robert Glasper Experience, Elle Varner, and Anthony Hamilton. That would be an exciting category. Instead, it’s two categories that are only 60 percent good. Another tough category with six nominees. 2 Chainz could have easily been a nominee for Best New Artist. Rick Ross and Drake also had big years. Lupe, Nas, and the Roots are longtime Grammy favorites. Nas is my pick here. Life Is Good is a surprisingly thoughtful and personal album, with standout tracks including “Daughters,” which addresses the difficulties of raising children in a digital era, and “Bye Bye Baby,” where he discusses his divorce from singer Kelis. If they were to introduce a new category of awards for Grammy Awards, what should it be and why? If, in the Grammys, a song is nominated for ‘Song of the Year’ but not ‘Record of the year’, does that mean the song could have been performed better? How are the nominees for each Grammy category chosen?